Students will understand the ideas of and the differences between America’s current political parties and how the nation elects it's representatives. ​Students will understand the electoral process. Identify America's current political parties, and illustrate their ideas about government. Evaluate candidates for political office by analyzing their qualifications, experience, issue-based platforms, debates, and political ads. ​Political Party: a group of people who have similar beliefs/values and try to get candidates elected to influence governments’ laws. 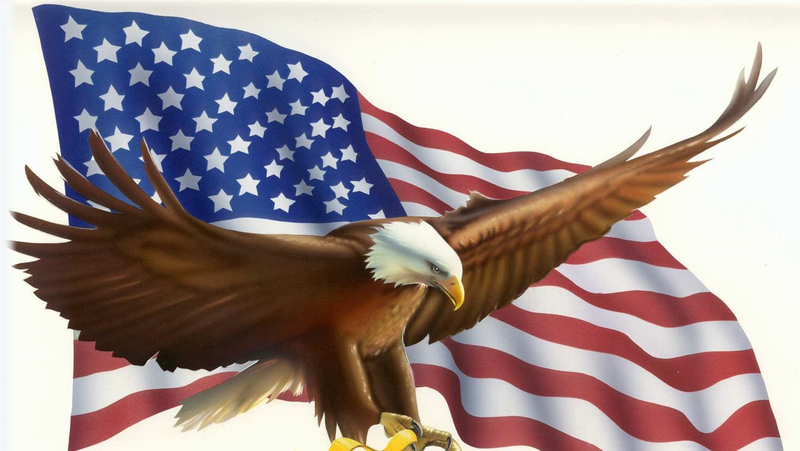 Two Party System: a party system where two major political parties dominate the government. Independent: A candidate who isn’t a member of the Republican or Democratic Party. Read through the document titled "Political Parties Questions." After reading about Democrats and Republicans, follow the directions below before answering the questions within the document. 1. Write down the name of ONE state with ALL Republican representatives. 2. Write down the name of ONE state with ALL Democratic representatives. Using the same webpage, click on Sort by State. 3. Find a state where the two senators from that state are members of different political parties and write down the name of that state. 4. Find a state where the two senators from that state are members of the same political party and write down the name of that state. 5. Based on questions 1-4, what conclusions can you make about the impact of location/region on political values across the country? Do you agree or disagree with George Washington's statement on political parties? 7. Which political party is President Trump a member of? What about our last President, Barrack Obama? 8. The two most popular "3rd parties" in the U.S. are the Libertarian Party and the Green Party. These are the only U.S. parties that aren't Democrat Republican with more than 100,000 registered voters. Write down the names of each of the following 3rd Parties. Then, match the name of the party with the correct term that describes their Party Platform. Click on each 3rd party below to read about their party platform. A. a political party that believes the government should control the entire economy, and there should be no private ownership of business. B. a political party that believes in individual freedom and believes the only purpose of government is to protect this freedom. Less intervention in people’s lives, business, and avoid foreign conflict whenever possible. C. a political party that believes in democratic government but also that the government should run some of the largest parts of the economy. D. this party believes in protecting the environment and upholding social justice while avoiding foreign conflict whenever possible. ​BONUS QUESTION: Write down the name of at least one "third party member" of Congress (House of Representatives OR the Senate) who are either serving now or have served in the past. When did they serve and for what state? 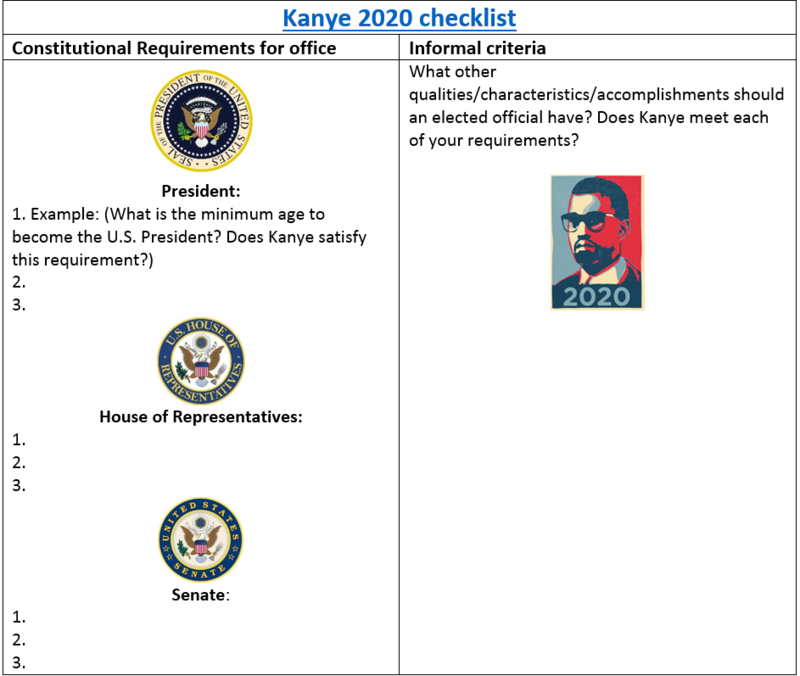 Task 3: Kanye for President? Popular Vote: the number of votes for a candidate that come from the people voting, NOT representatives like electors. 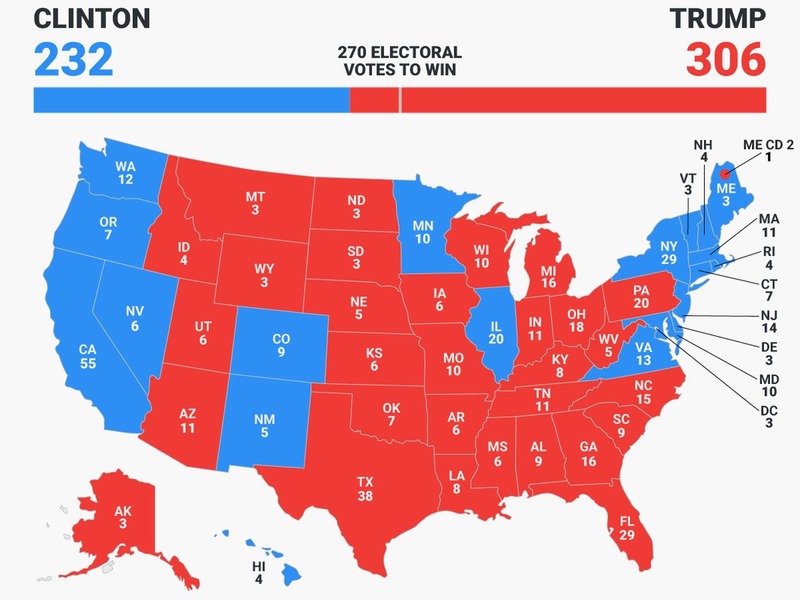 Electoral vote: a vote cast by a member of the electoral college for President. 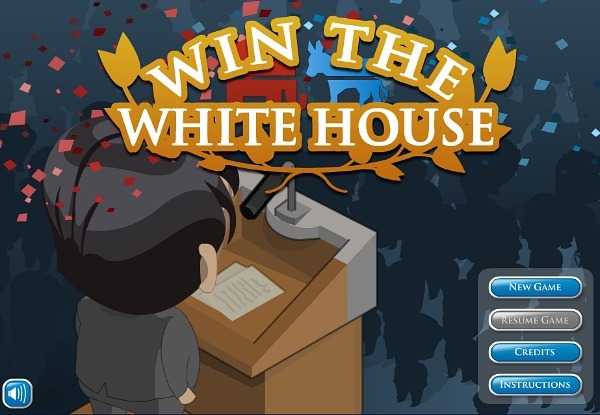 ​Directions: After we watch the video to the right, you will write a paragraph response that summarizes the basics of how the Electoral College Works. We will stop and discuss periodically throughout the video. ​DIRECTIONS: CLICK HERE to go to 270towin.com and go through the attached questions titled "270 to win Questions." Each Platform topic should be described with at least a paragraph summary. You are creating your own political party; so develop your own philosophies and opinions on these issues. Step 2: Compare your NEW party values with that of the Democratic and Republican parties. Task 8: "Go ahead, throw your vote away!!" ​1. 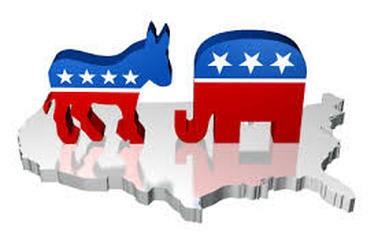 What are the two major political parties in America? The clips above offered political commentary. 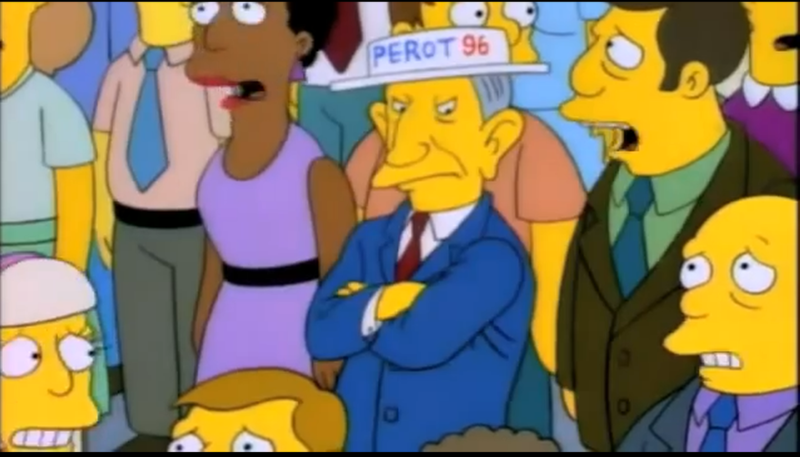 What were the writers on The Simpsons trying to express about American politics in the clips above?